This beef and sausage meatloaf contains finely chopped vegetables, cracker crumbs, ketchup, and seasonings. The sausage in this loaf adds necessary fat, which makes for more flavor and moisture. The loaf is topped with tomato sauce, but feel free to finish it with a layer of ketchup or barbecue sauce. Chop the vegetables by hand or use the food processor to chop them finely. To add extra flavor and nutrients to the loaf chop a carrot along with the celery and onion. Use a lean—about 85/15—ground beef in the recipe. If you do use all ground beef in the meatloaf, an 80/20 ratio is best. Serve this flavorful meatloaf with mashed or baked potatoes and green beans or corn for a fabulous everyday family dinner. Heat the oven to 350 F. Lightly grease a 9-by-5-by-3-inch loaf pan or spray it with nonstick cooking spray. Combine the chopped onion, celery, and garlic. Combine the beef, sausage, and crumbs; mix until well blended. Add the chopped vegetable mixture, the egg, milk, ketchup or chili sauce, salt, and pepper. Using your hands, mix the ingredients until blended. Pack the beef mixture into the loaf pan and bake for 1 hour. Carefully pour off the excess fat. Then, pour the tomato sauce over the top of the loaf. Return the loaf to the oven and bake for 20 minutes longer. Then slice or remove to a platter, as desired. If you like to plan ahead, consider doubling the recipe and make two loaves. Bake them both and freeze one for a future meal. Wrap the extra meatloaf tightly in foil and freeze it for up to 4 months. For longer storage, freeze the loaf on a baking pan and then use a vacuum sealing system to wrap it. 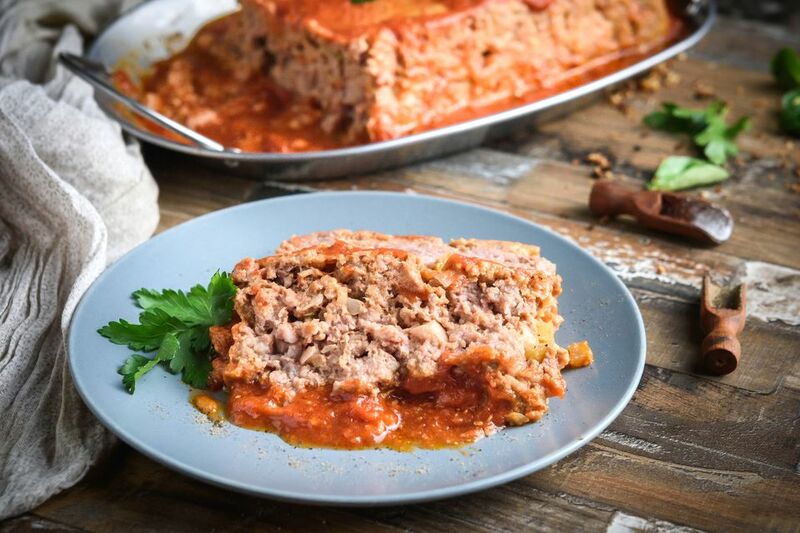 Defrost the meatloaf in the refrigerator and then wrap it in in foil and heat it in a preheated 250 F oven for about 20 to 30 minutes, or until the loaf reaches 165 F.
To reheat a frozen cooked meatloaf, wrap it in foil and bake it for about an hour in a 325 F oven. Make a DIY meatloaf pan. Buy an inexpensive loaf pan (metal or foil) and use a sharp tool to punch several holes in the bottom (about 1 1/2 to 2 inches apart). Put the meatloaf in the pan with holes and place it in a baking pan. This way, excess fat will drain into the outer pan.